Kinoshita Taika graduated from Sokei Academy of Fine Arts in 1980 and completed a graduate level course on printmaking in 1981. Spotted as a talent early in his career, his prints were chosen for exhibit in the annual, prestigious Nihon Hanga Kyokai (Japan Print Association Show) beginning in 1980, and in 1993, he won a coveted government grant from the Agency of Cultural Affairs to study in Europe. Since then, Kinoshita-san, a native of Hiroshima, has had numerous exhibitions in Japan, but also participating in international print competitions as far afield as the World Print Festival in Slovenia. Kinoshita-san has developed his own, highly innovative techniques for creating woodblocks. This often entails using the back of the woodblock to capture naturally occurring knots, wood grain, and joints to form the image he desires. The artist may also drop or splash undiluted varnish directly on the block to form an image of water droplets or dew. Finally, to achieve a more illustrated, drawn or etched effect, the artist will bend the traditional woodblock technique, by cutting fine lines into the block and then using the intaglio method of printing, i.e., the block is inked and then wiped, so that the ink flows into the grooves. Flowers and Mt. 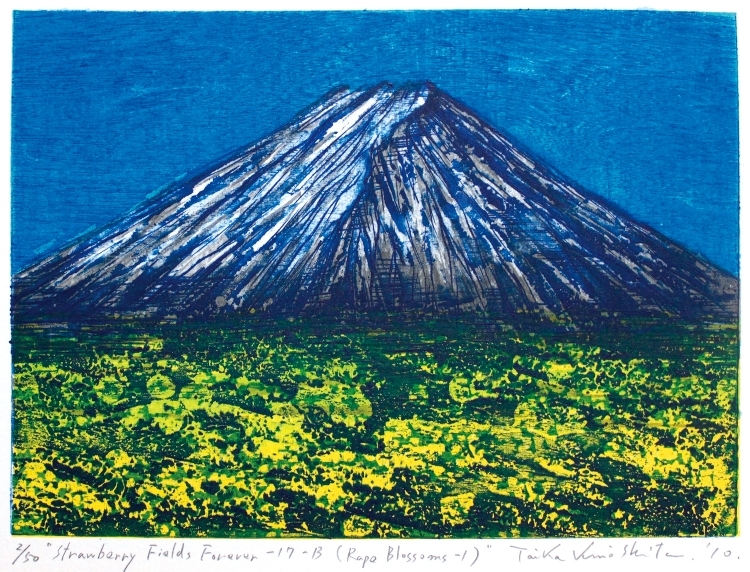 Fuji are two of Kinoshita-san’s recurring and stunning themes. In both, he seeks to evoke what he describes as his own awareness of and participation in life force and nature. The result is always a fresh, completely original expression.